Often people are unsure what makes a good domain name for their website; below are some basic hints and tips to help you make the decision. Should I get a .com domain name or .co.uk or something else? If your main place of business is the UK, get a .co.uk domain name – many people in the UK prefer to buy locally and it could give you that advantage. However, if your business can cater for all international clients and you have no preference for the UK, a .com gives your company that multinational feel. Alternative endings such as .net and .org can be suitable although they suggest more informational, non-profit sites. If you do choose one of these endings, be aware that if you don’t specify in your literature that you are using one of these endings, people may not try them as a matter of course and may not find you. Most other endings look tacky, for example the dreaded .biz. How do I make my domain name memorable? Make it meaningful to be memorable – make sure it is something that is easy to say and instantly meaningful. You may want to use an abbreviation to keep it short, but if what your final domain name amounts to is a random string of letters or numbers, it makes it very unlikely to stick in someone’s head. Then you have the danger that even if they are looking for you specifically, they can’t find you simply because they’ve got a couple of the letters mixed up. www.wzdns.co.uk only has five letters, but is infinitely harder to remember and interpret than www.wizardnews.co.uk which has twice as many letters but is a meaningful semantic string. Also, don’t forget people rarely type in domain names these days, usually they either click links or use autocomplete (where the computer guesses what you’re typing and completes it for you). Having said that, don’t go overboard trying to get your meaning across in the domain name – yes, you want to tempt people to click it, but you can’t include your whole business history. Choose something like www.wizardnewsforallbuddingyoungwizardsintheuk.co.uk and you may as well hang up your wand now. As a rule of thumb, two or three words max. What about putting keywords in my domain name? Having keywords in your domain name used to be a key factor in gaining rankings, but as with all easy answers, Google clocked that people were abusing the system. So if it makes logical sense to put keywords in the domain name, then great. But don't do it purely for SEO purposes. If it is a new domain name that nobody has come up with and snapped up yet, then you should be looking at paying no more than about £30 for a .co.uk or £50 for a .com. You can get them a lot cheaper than that, but it depends if you want someone to configure it and set up email on it for you, or whether you have the expertise to do it yourself. If however, the domain name you want has already been purchased, you could be looking at a hefty sum - how much you pay is really up to you - and depends on how important your brand and identity are. If you are very well established and have a large turnover, it may be worth paying in the thousands for the 'right' domain. However, if you are a small local business, chances are you can get away with changing it slightly to something that hasn't been registered already - and save yourself some cash. How can I ensure my domain name has everything? Well, you can't. At some point you have to make a decision about your priorities. If traffic is a priority, then use keywords instead of your company name. If image is the most important thing, get the right domain name, and you may even consider paying more for a high value domain name. 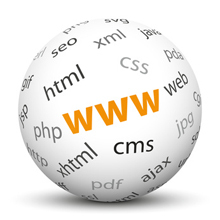 If cost is an issue, you may have to make sacrifices - domains are a very competitive product. We're happy to give free advice on the phone about your particular case if you wish. How can I find out if my domain is available? Type in your domain name and click 'Lookup'. If the search brings back records, the domain is already registered. If it finds no records - the domain is available. WARNING - a word of warning about checking availability of domain names. There are rumours that some unscrupulous people monitor searches on domain name availability. If they see someone search for a new domain name, they then snap it up and try to extort higher amounts from the person who wanted it. You have been warned!